This tutorial will cover all steps necessary to create a new team and get it functional in the game. This is considered an advanced tutorial and should be attempted only after you have become familiar with how modding BF2 and the Editor work. The process isn’t particularly difficult, but there are many steps involved, and missing one or performing a step incorrectly can result in unexpected results or the game crashing. Please try to be patient and double-check your work. 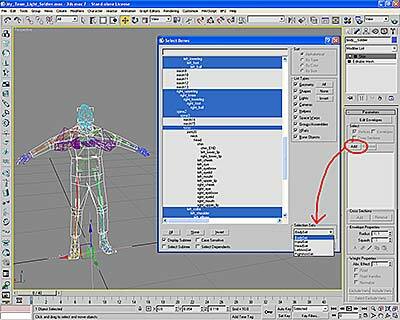 Open up the tutorial files folder you downloaded and locate the “Blank_Soldier.max” file. Copy this to “…\Rawdata\Animation\Blank_Soldier.max”. This tutorial assumes that you have created a new player model and textured it. The model should consist of three meshes: the body, the head, and the hands. 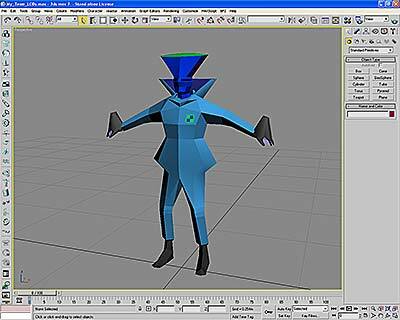 Note that the hands should be merged together and considered as one mesh. For the rest of the tutorial, we will be working with the “light” soldier. All the same steps apply to the “heavy” soldier, just substitute “heavy” where appropriate. The textures for the body and hands should be contained on one 1024x1024 image. The head should be on a separate 512x256 image. You may want to unzip the retail BF2 Objects_client.zip to somewhere on your hard drive (not in the game) and look at the existing textures for reference. If you have not created the models for your team, you can use the tutorial files provided. 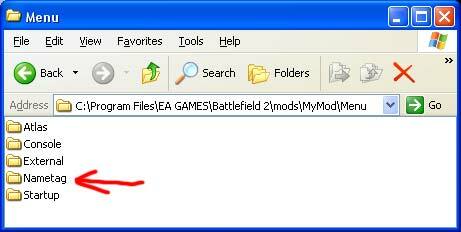 After downloading, place the folder “My_ Team ” in “…\bf2editor\RawData\Objects\soldiers\My_ Team ”. Create any folders necessary to create this path. We’ll deal with the other tutorial files as we go. The first thing we’re going to do is double-check that you have the textures set up right and that everything is in the correct path. C:\\Program Files\EA G ames\Battlefield 2\ bf2editor\RawData\Objects\soldiers\My_ Team . Note that you should have both a color texture and a normal map for both the body and the head. The normal map is what should provide small details such as wrinkles in clothing and so on. Open your work file. 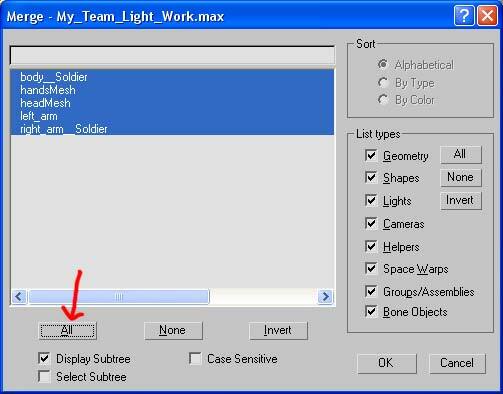 If you are using the tutorial files, this will be “My_ Team _Light_Work.max”. I add “_Work” to the end of the label of my initial file so that I know this is the original. This way it won’t be confused with the final version we create. You may want to label your files the same. 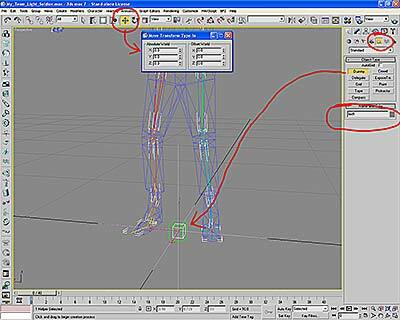 Note that there are two materials: One for the body and hands, used for both the third- and first-person views, and a second for the head as explained earlier. The first thing we have to do is get the meshes into the same file as the skeleton. 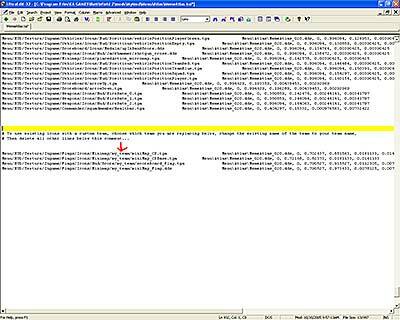 Using “File>Merge” from the main menu, select the “My_ Team _Light_Work.max” file that we looked at previously. Before we go any further, save your scene as “My_ Team _Light_Soldier.max” in “…\RawData\Objects\soldiers\My_ Team \”. 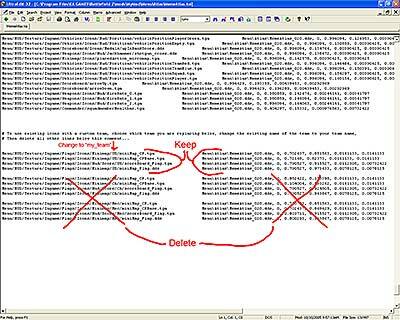 This is important so that you don’t accidentally overwrite any of the original files that you may need again later. Note that the hands in the 3p- and 1p-skeletons are different: In the 3p skeleton, there are only three fingers. The thumb and trigger finger are each skinned to individual bones while the rest of the fingers are all skinned to the pinky. In the 1p skeleton, each finger has its own corresponding set of bones. 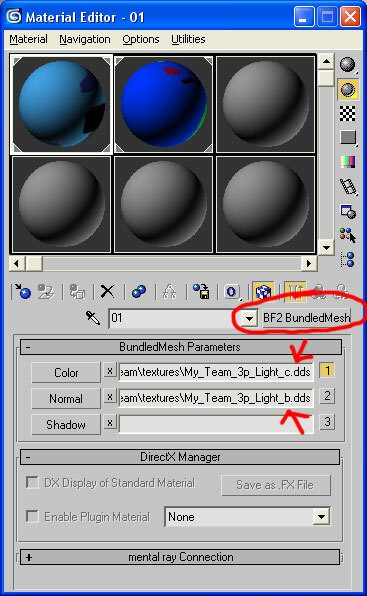 When using your own meshes, make sure that the names of your pieces exactly match those in the tutorial file. We’ll go over them now. This is the body mesh of the 3p player. Note the “__Soldier” at the end of the name. It begins with two underscores and “Soldier” is capitalized. The name must match exactly. These are the hands for the 3p player. 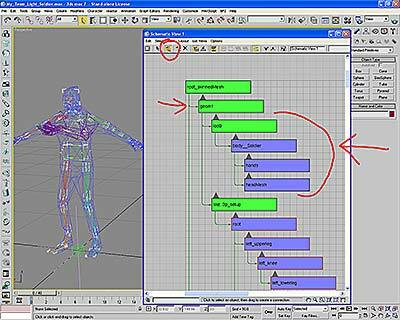 Note that both hands are part of the same mesh. The name can be anything you want, though it’s best to follow this naming convention. This is the 3p player head. The name can be anything but “head”, since this is the name of one of the bones. Naming both the same will confuse the exporter. Once again it’s best to stick with the recommended naming convention. This is the right arm of the 1p player. This name again ends with “__Soldier” and must be named exactly as shown or the exporter may not work right. The left arm of the 1p player. The name doesn’t need to match exactly, but like the others, it’s best to stick with the recommended naming convention. Note: The two arms for the 1p player can be made by duplicating the 3p player body mesh, deleting polygons and reshaping to fit the 1p skeleton. You may have to change the dimensions of certain parts of the arms or hands because the 1p camera view is different than the 3p camera view. Also note that each arm consists of the arm and the hand attached together as one mesh. This will be important later when skinning. With the player meshes merged into the skeleton scene, it’s time to skin them. 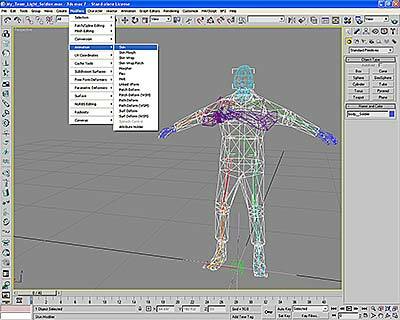 Make sure that the body mesh is still selected, and in the Skin Modifier rollout, click on the “Add” button in the parameters section. 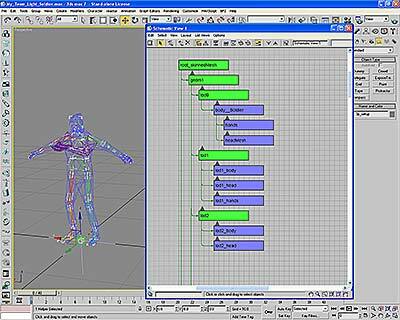 This will automatically add the correct bones to the body mesh. Repeat steps 11-13 for all the remaining meshes, both third- and first-person. There is a selection set for each piece. “LeftArmSet” and “RightArmSet” are for the 1p meshes, and the others for the 3p meshes. Now that you’ve skinned your meshes, you’ll have to adjust the weights. It is beyond the scope of this tutorial to teach the weighting of vertices. There are many different techniques, and you should use the one that works best for you. A maximum of 26 bones can be assigned per mesh. A maximum of 2 bones can influence each vertex. Note: You do not have to get the weights perfect now. It may be preferable to wait until we get to viewing your player skin with animations in the editor and in-game, then come back and fix the trouble spots. Note: This is an optional step that you may want to put off until after you have successfully imported your first team. You want 3 LODs total. The meshes you previously skinned are considered lod0. Notice that there is an lod1_hands, but not an lod2_hands. This is because at the distance these would switch in, you wouldn’t see them anyway, so they aren’t necessary. Notice that I’ve created some pretty whacky meshes here. The reason is because this is a test and this way I can see from a distance when the LODs change. Also remember that there wouldn’t be any additional LODs for the first-person meshes because only the player will see them and the distance to the camera never changes. The “Blank_Soldier.max” file already has most of the hierarchy set up correctly for export. The only thing we have to do is add the meshes. 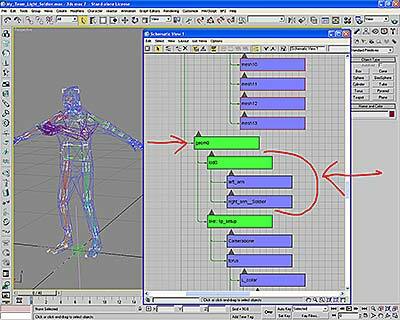 Open up a schematic view by choosing “ G raph Editors>New Schematic View…” from the main menu. In the schematic view, choose “Edit>Connect” from the menu (or click on the Connect icon). Connect the “hands” and “headMesh” pieces under the “body__Soldier” piece. 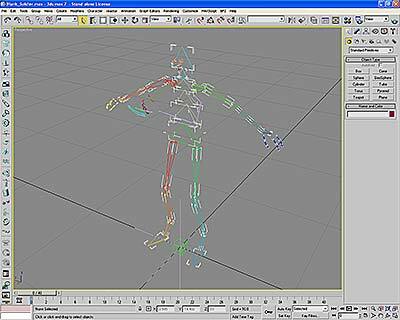 Connect the “body__Soldier” piece under the “lod0” node at the top of the hierarchy. Note that in the screenshot, I’ve switched the schematic view to Hierarchy mode rather than the default References mode. Your schematic view may be slightly different. Scroll down in the schematic view until you find the “geom0” node. Underneath this will be the second “lod0” node. Remember that geom0 always contains the first-person meshes and geom1 contains the third-person meshes. Note: These steps are optional and only required if you have skinned the additional LODs. To add the LODs to the hierarchy we will have to make more lod nodes. Close the schematic view or move it out of the way and zoom in to the origin of the grid. Under “Object Type”, click on the button labeled “Dummy”. Click on the grid near the origin, and with the mouse button held down, drag the cursor out a little bit to create the dummy object. It will look like a cube. The actual size doesn’t matter. Just keep it about the same size as the others. With the dummy still selected, change the name to “lod1”. Repeat steps 23-28 to make another dummy node. This time label it “lod2”. 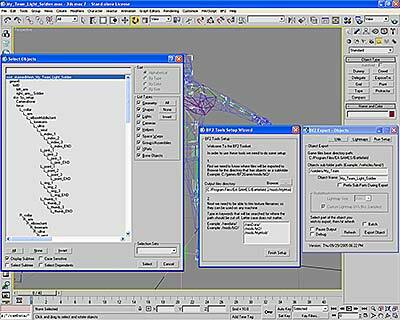 Using the previous connection method, connect “lod1_body”, “lod1_head”, and “lod1_hands” under “lod1”. Do the same thing connecting “lod2_body” and “lod2_head” under “lod2”. Remember that you have to skin the additional lod meshes the same way as the original for this to work. We have now completed the soldier scene file. The next step is to export. Save your work again if you haven’t done so already. We want to make sure we don’t lose any of the work we’ve done. Select “BF2>BF2 Exporter” from the main menu. In the BF2 Exporter window, click on the “Run Setup” button. In the BF2 Tools Setup Wizard window that opens up, make sure that the output path is set to the correct mod. Click on the “Finish Setup” when you are done to return to the exporter window. 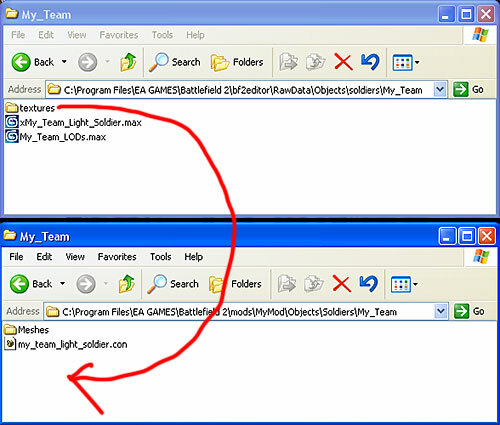 In the exporter window, set the Objects sub-folder path to “/soldiers/My_ Team ”. Substitute the name of your mod if necessary. Set the “Object Name” to “My_ Team _Light_Soldier”. Again, substitute the name of your team if necessary. With the exporter window still open, select the root node of the hierarchy. I recommend using the “Select by Name” window. You have now exported your new team, but before we can use it, we have to do some file management and editing. Locate the “us_light_soldier.tweak” file that came with the tutorial files and copy this also to “…\mods\MyMod\Objects\Soldiers\My_ Team ”. This file is from the Objects_Client.zip file of the retail game and has had the “read only” option turned off so you can edit it. 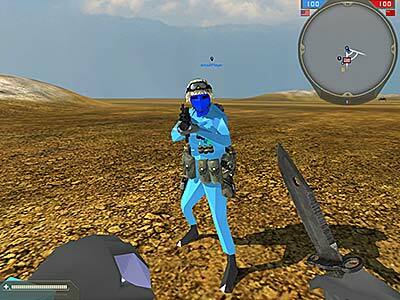 Open the “my_team_light_soldier.tweak file in your text editor. Remember: If you have copied this file from the unzipped Objects zip archive, it will be Read-Only until you change it in its properties box. I’ve already done this to the one included with the tutorial files. 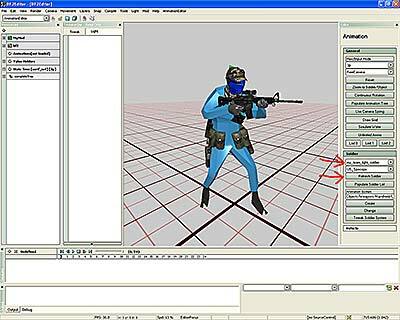 We are now finally ready to view our new soldier in action in the editor. 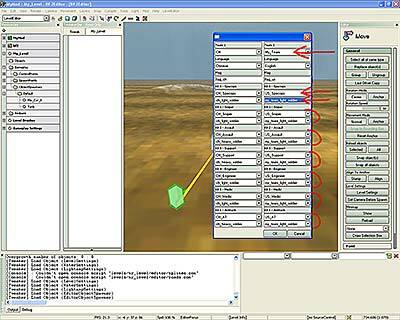 Launch the editor (selecting the correct mod at start-up) and switch to Animation. On the right side, in the section labeled “Soldier”, click on the drop-down list and select “my_team_light_soldier”. You should now be able to use all the normal animation window controls to view your new soldier in action with various kits and animations. There are several more things we have to do before we can actually place the team in a map and play. The first is to edit one of the editor files. Quit the editor again. We will need to restart once we finish so that the editor loads the updated files correctly. Locate the file “…\Battlefield 2\bf2editor\mods\MyMod\LevelEditor\LevelSettings.con” and open it. Note: Do not change any of the other text in this file. It will currently be incorrect, but you can ignore this because the editor changes this each time you work on a level. Save this file and launch the editor yet again. Switch to the Level editor and load up the level you want to insert your new team into. On the right side of the editor, click on the “Level Settings” button. Click on the drop-down box directly under Team 1 or Team 2 and select “My_ Team ”. Notice that the fields below change. Click ”Okay” to apply the changes. Add control points, spawn points, and whatever else you want as usual and save your map. Because of the way the game is structured, when you add a new team, the game automatically looks for certain minimap icons associated with the team. This is good in that you don’t have to do a lot of custom coding to get your new icons in. It’s not so good in that if you don’t account for this now, the game will crash. There are two ways to fix this: we can create new custom icons, create a new texture atlas, and edit the MemeAtlas.tai file to find these new icons, or we can just edit the .tai file to use existing icons with the new team. We are going to use the second option in this case because it will get us up and running faster. One limitation of the game is that it will only recognize one MemeAtlas.tai file, so we have to edit the existing file and then make sure the game loads our custom version first. Close the editor if you haven’t already. As usual, this is to be sure that once we have finished editing the files, the editor loads the updated versions correctly. A texture atlas is simply one huge image into which a whole bunch of smaller images have been placed. Texture atlases are used for optimizing the game. It’s a lot faster for the video card to load one big image than a whole bunch of tiny ones. A .tai file is just a text file that tells the game where inside the huge texture atlas each original tiny image was placed. “.tai” stands for “Texture Atlas Index”. In the .tai file you’ll notice two columns: the one on the left lists the image that was added to the texture atlas, and the one on the right gives the coordinates and size of the image inside the texture atlas. In this tutorial, we are going to replace the US side, so in each line where it says “US”, replace the text with “my_team”. You have to do this in each of the four lines of the group. Note that I have this highlighted in the screenshot above. There are a few icons we have to copy manually to the Menu folder because the .tai file doesn’t look for them. Locate the folder labeled “Nametag” that is included with the tutorial files. Note: the contents of your Menu folder may or may not include all the folders seen here. Some are empty but may have been created if you have previously used the packager. As mentioned above, the game only permits one MemeAtlas.tai file, so if it finds the one in retail BF2 first, it will ignore the changes we made in the mod. We will correct this now by telling the game which order to load things in. Open “ClientArchives.con” in your text editor. In this .con file, you will see two sets of text. They all start with “fileManager.Archive”. The first set then has a path that starts with “mods/bf2/” and ends with “Objects_client.zip Objects” and so on. The second set doesn’t have a path. All we need to do is change the order. Make sure this file is also saved and close your text editor. The game will now look for the mod files first and then load anything additional it needs from the retail BF2 archives. This way our custom MemeAtlas.tai file will be loaded instead of the original. Because of the particular files we have added, we have to package the mod before the changes will show up. This is a good habit to get into anyway. Launch the editor and choose “MyMod” or whichever mod you are working with from the start-up screen. Switch to the Level Editor and load up the map that you added the new team to. With the level loaded, select “Mod>Package Mod” from the main menu. In the options window that pops up, make sure that both “Package this level:…” and “Package the active MOD:…” are checked and click “OK”. This makes sure that all changes we’ve made to both the level and the mod get added to the zip files. Every time you want to test, you should get in the habit of doing a “Save All” from the file menu and then packaging. This is the best way to be sure you are testing the most recent changes. We have now done everything we need to get our new team in. Unfortunately, the packager puts the MemeAtlas.tai file in the wrong place. We must correct this now. Close the editor one last time. We are done with it now. 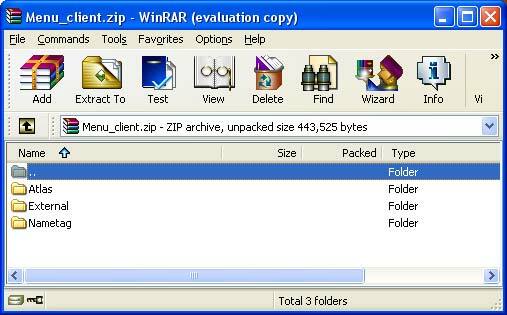 In your root mod folder, find the “Menu_client.zip” file and open it with with an archiving program such as WinRar. Leave this open and with a second instance of your archiver, open the “Menu_server.zip” file. Depending on what else you have done in your mod, this may or may not be completely empty. 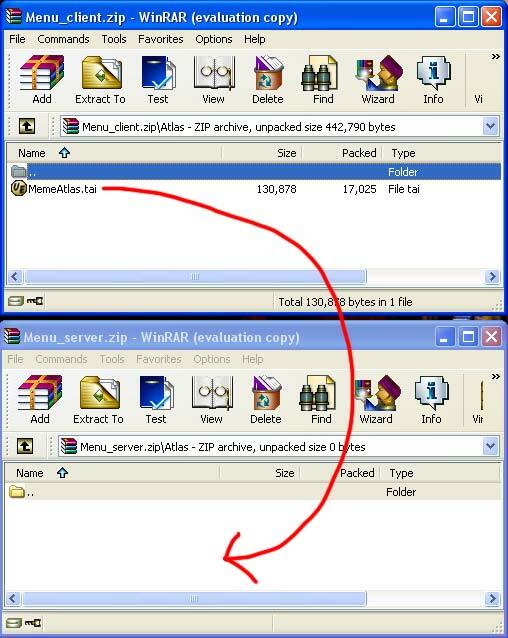 In the “Menu_server.zip” file, you will need to create an “Atlas” folder if one doesn’t already exist. Note: This method works with WinRar. If you are using a different archiver, you may need to use a different method. Just be sure that the path is “Menu_server.zip\Atlas\MemeAtlas.tai”. Placing this file anywhere else may cause the game to crash. Also note: If the only file in the “Menu_client\Atlas” directory is MemeAtlas.tai, as it is here, you can just copy the “Atlas” folder to the Menu_server zip archive instead of creating a new “Atlas” folder inside it. Close these archives. You are now ready to test locally. Important! The files are now ready for you to test by yourself on a local server. If you want to test with others or over the internet, there are some additional changes you need to make to the packaged files. Please see the “Internet Mod Testing Procedure” tutorial for details. Congratulations. You have just inserted your first custom team into the game.